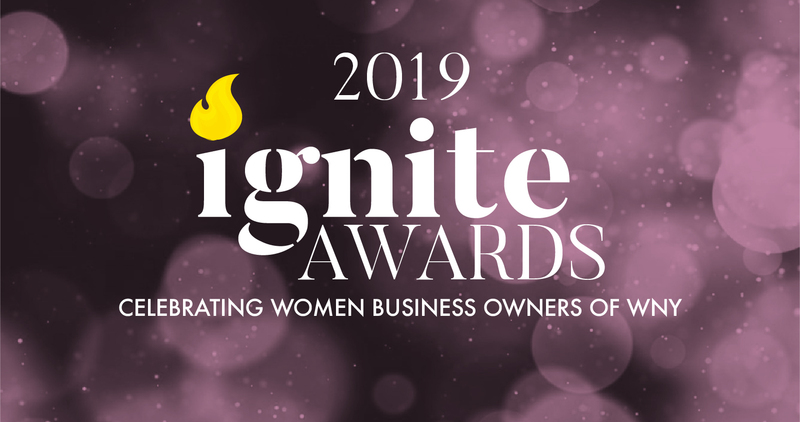 The Women’s Business Center (WBC) at Canisius College is hosting the 3rd Annual Ignite Awards Luncheon, recognizing successful women-owned businesses in the Western New York area, and we are seeking your support to help us fund future programming and events to support these businesses. Our mission is to empower entrepreneurs to succeed through education, connections and community. We do this by developing leaders, fostering opportunities and building collaboration. This event brings together the services that entrepreneurs need with the women business owners who need them for a mentoring and networking opportunity during lunch. We encourage your company to send staff who will be seated at tables with other non-competing businesses and at least two small business owners. Members of our Advisory Board or staff will also be at the tables to help facilitate conversation and connections. Platinum and Gold sponsors are invited to nominate one woman-owned business for an award to be given out that day at the luncheon. The business you nominate will be honored on stage with a short presentation about your organization and the business you have nominated. This allows for a majority of the time to be used by your staff members to get to know and interact with the small business owners who are seated with them at the luncheon. The WBC Ignite Awards is a not-for-profit event that funds itself through the generosity of sponsors. We are seeking cash and in-kind sponsors to help cover primary costs for the event. All the WBC Ignite sponsorships include prominent recognition, leading up to and during the event. Why Should Your Company Support This Event for Women-Owned Businesses? The WBC recognizes the critical role these businesses play in our community and to our economy and invites your organization to join us in honoring several of the key women business owners in WNY. If you are interested in finding out more about sponsorship opportunities, please contact the WBC at wbcinfo@canisius.edu or call (716) 888-8280. Each sponsor level includes prominent placement on the WBC’s website, social media and all print materials distributed for the event. Availability is limited; please contact us as soon as possible to secure your sponsorship. **An important note about luncheon seating: This very unique event will match up the small business attendees at each table with non-competitive business support services, along with a table facilitator to encourage an easy and productive conversation. Bring plenty of business cards!